Create memorable interactive experiences — without coding. That's why we created Vuo for you. Many professionals choose Vuo because of its graphics quality, performance, and stability. Use Vuo with MIDI, OSC, Art-Net, Syphon, and other I/O. You can change inputs on the fly and see the results instantly. Vuo's automatic multi-threading and efficient graphics make it possible to do more in realtime. Beginning with simple building-block names such as "Play Movie," Vuo is easy to learn. Get started with our tutorials, manual, and examples. ↑ Here are some compositions by the Vuo community. Check out the Composition Gallery for more. Sign up for the Vuo announcements mailing list to get news and join the community. 1,711 people have signed up so far! I just moved over from Quartz Composer and loving VUO, fascinating little program. Well done! I haven't had such a great time with any framework/library/visual programming system since originally starting to use QC. Vuo is already much better than QC in several ways. They're actively developing Vuo and asking for input — you can't ask for more than that, really. 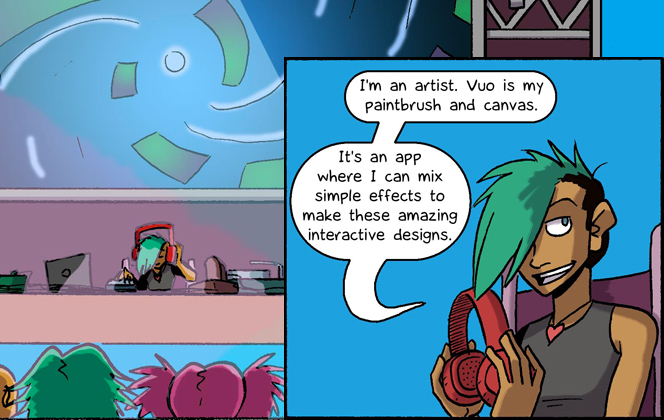 As an artist who thinks visually but enjoys the power that coding grants, Vuo is exactly what I've wanted for a long time. . . . Thanks for making live video coding so accessible! Vuo is so much fun, even the coder in me has to admit that visual programming works here. Vuo has achieved a lot in a relatively short period of time. They also do a great job when it comes to listening to the user community. Discovered Vuo about a month ago and haven't been able to stop building things. I have started to pick up Vuo very quickly — even though QC is very different to Vuo. Vuo makes much more sense — and things just work. You don't get that strange feeling you are hitting your head against a brick wall!